This is a thick, hearty soup that can fill up in no time; especially, when you serve it with hard crusted bread. Personally, I like to let is sit in the fridge covered overnight. 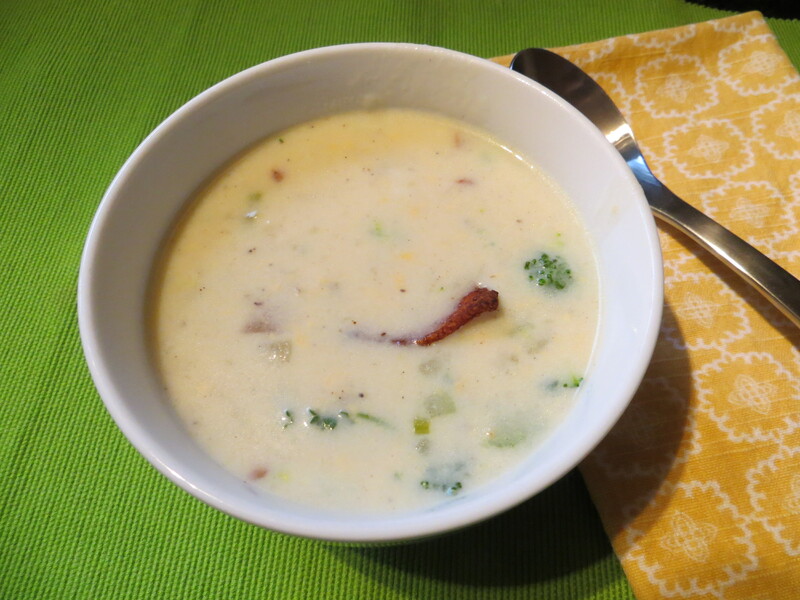 It makes for a creamier thick soup when you reheat the next day. Serves: An army, just kidding. It will generously serve 8 people. 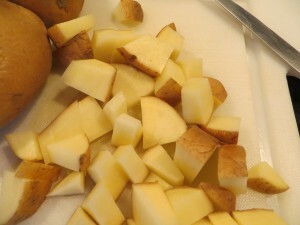 2 1/2 pounds potatoes (you can use baby reds if you like), sliced into bit size pieces. No need to peel them. 4 chicken bouillon cubes, dissolve in the one cup potato water then return to the pot. Boil potatoes and broccoli in a large pot of water for 10-12 minutes. Drain, but reserve 1 cup of potato water. Return potatoes and broccoli to pan and set aside. Dissolve chicken bouillon in reserved potato water and return to pan. Cook bacon until crisp. Remove and set aside. Drain fat from the pan. 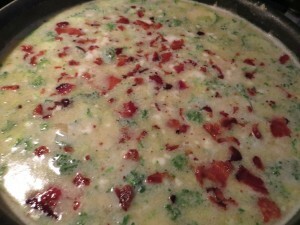 Add onion and celery to the bacon pan and cook over medium-high heat until celery is tender, about 5 minutes. 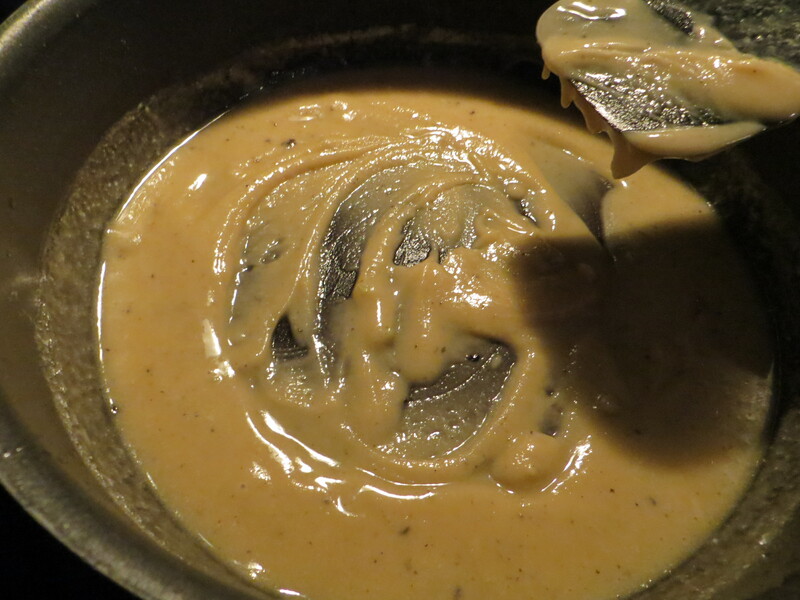 To the potato pan, add milk, 3 cups water, salt and pepper. Cook over medium-high heat until mixture is very hot, but not boiling. About 8 minutes, stirring often. thick and cream. (Optional) I used a handheld potato masher to break down the potatoes so the soup was not so chunky. It’s just a personal preference. Crumble the cooked bacon and add to soup along 3/4 cup of cheese. 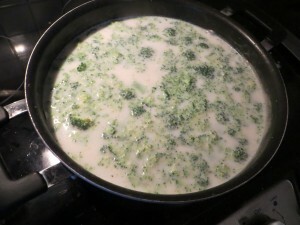 Stir soup until cheese has melted. Add parsley. Serve hot and garnish onions. Don’t ask for a calorie count on this one. With all that butter, cheese and bacon just know it’s vein-thickening and packed with calories. But, yummy ones!